Interior Minister of Pakistan Rehman Malik has said that Inter Service Intelligence (ISI) is not helping Afghan Taliban and Blames against it are completely wrong. Rehman Malik said that Mullah Umar and Usama Bin Laden are not in Pakistan but in Afghanistan. 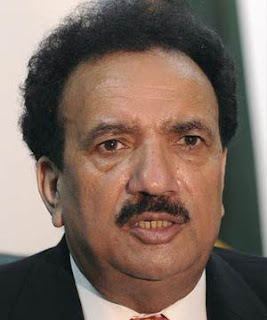 Rehman Malik was answering to recent blames on ISI by Western Media and some US officials. Rehman Malik said that we have also talked with American officials about Brahamdagh Bugti who is sitting in Afghanistan and we have shown our concerns about his activities. Rehman Malik said that we have demanded America to hand over Dr Aafia Sdiqqi to Pakistan and we are hopeful for good news about it soon.